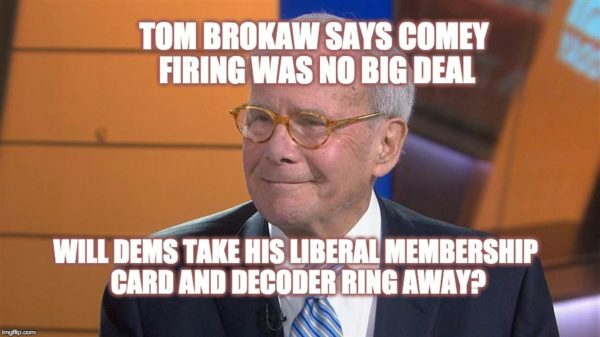 Ancient media liberal and one of the inventors of fake news himself, Tom Brokaw, suddenly became the voice of reason earlier this week when he chided liberals for pretending that the firing of Jim Comey was a big deal. The disgraced NBC newsman reminded viewers that he’d been around Washington, D.C. for a very long time and Trump’s firing of Comey really wasn’t that surprising or even that influential. Brokaw explained that comparing Comey’s firing to Nixon’s last ditch efforts in the 70’s is wrong and that the big difference here is that Nixon had no reason to fire Archibald Cox, but almost everyone in Washington, D.C. felt that James Comey should be fired. “Well, this is not the Saturday Night Massacre. I was there covering the Saturday Night Massacre. We had a criminal conspiracy in the White House, well known that we were working to find out what had gone on. Some of the president’s top aides were on the way to jail at that point. The investigation had been going on for 18 months. There was nothing that Archibald Cox did that would justify his firing in the eyes of almost he have one including Republicans on that side. It was a much different kind of situation then. And the consequences were obviously very big.